APARTHEID ERA MINISTER PIK BOTHA DIES! 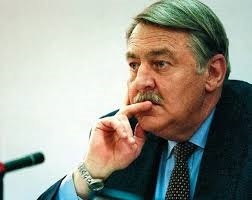 THE apartheid era foreign affairs minister Roelof Frederik "Pik" Botha has died, at the age of 86. Botha was reportedly admitted to a hospital Pretoria in late September. He served as foreign minister in the last years of the apartheid era, the bulk of his career was spent defending South Africa's apartheid system of racial segregation against foreign criticism. Botha began his career in the South African Foreign Service in 1953, serving in Sweden and West Germany. In 1966, Botha was appointed law adviser at the South African Department of Foreign Affairs. In that capacity, he served on the delegation representing South Africa at the United Nations from 1966 to 1974. He was appointed South Africa's ambassador to the United Nations, but a month after he presented his credentials, South Africa was suspended from membership of the General Assembly. Hearing Pik Botha’s son saying his father was worried about the deteriorating state of South Africa on his death bed is almost laughable. Pik Botha dies. My condolences. May his soul Rest In Peace. His role in pressurizing the NP leadership to change for the betterment of SA & it’s people is well documented. Pik Botha is no more but Apartheid is alive and well.